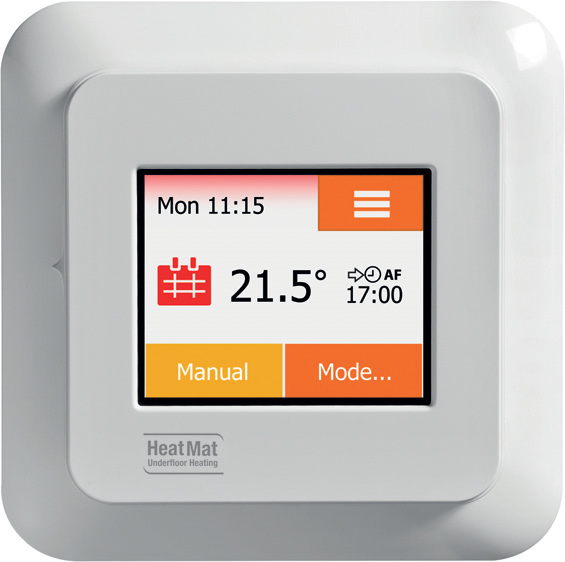 The HeatMat NGTouch NGT-2.0-STND thermostat is an inutitive touchscreen thermostat and timer control system designed for use with any of Heatmat's underfloor heating systems. It can even ben used with other manufacturer's systems. It features a colour touchscreen, allowing for easy menu navigation allowing you to customise and set your own preset modes or choose from a selection of preset lifestyle modes such as "holiday, frost protection, comfort and boost mode". Heatmat have pushed the "intelligent" home with there adaptive function. This allows the thermostat to learn the characteristics of a room and turn on the heating at the right time to ensure the right heat levels when you need the room. The NGTouch can also be operated in manual mode, by simply increasing or decreasing the temperature using arrows on screen.